For reasons known to most of us, the shocking nature of this song is also a prophetic. Over the past two decades, the United States has had more school shootings and students killed in these shootings than the rest of the world combined. It saddens me that we are no longer shocked when these horrible events happen – we should be, but it is all too common of an occurrence. Book recommendation: to get some reliable information about the shooting and how media twists events and information, read Columbine by Dave Cullen. It is a horrific and important account of what happened that day by a man who covered the events and has had access to every piece of evidence. Thanks Emma! It was actually Robert who wrote this. He is a high school English teacher, which makes this even more poignant. I wasn’t too familiar with this song, but I listened to it before I published the article, and I love it! They don’t make songs like this anymore! 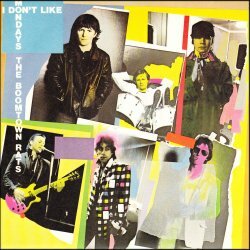 The Boom Town Rats were an insignificant blip in the 80’s, bandwagon boys who could hold a candle to bands like The Clash, Buzzcocks and The Damned. Bob Geldorf has always been an outspoken self publicist and a second rate band was his ticket to becoming a celebrity. I always remember him swigging back lager at Live Aid telling everyone to forgo the pub for the night and send money to the charity he high jacked from Midge Ure.